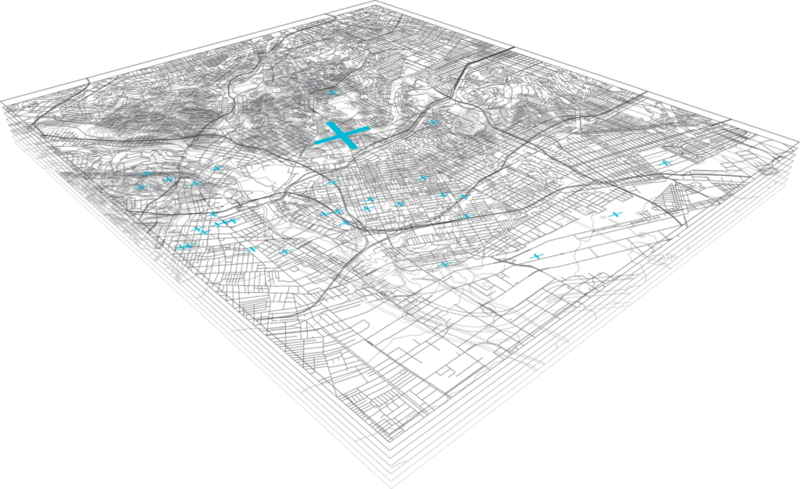 Conducted in tandem with the development of the Hopscotch opera, “Mapping Fiction” considers the built environment not only as the setting for narrative but as the catalyst for generating stories about Los Angeles. The opera and my work focused on three sites – Boyle Heights, Elysian Park, and the Downtown Arts District. Each of these sites’ histories were examined through both archival documentation and research into site myths, memories, and fictions. The project began as an experiment in four-dimensional mapping. It considered mapping methods that not only depict territorial information but also embed time, stories, memories, myths, and fictions within the bounds of the map. Just as the city is a palimpsest of past presences – a collection of stories, memories, myths, fictions, artifacts shed across the deep strata of the landscape, the map attempts to function in the same way – layering time, space, and narrative into a single navigable experience. The experience of “reading” this map then becomes an active archeological process of uncovering information through a process of engagement with the material – a process that is emergent in its findings – i.e. 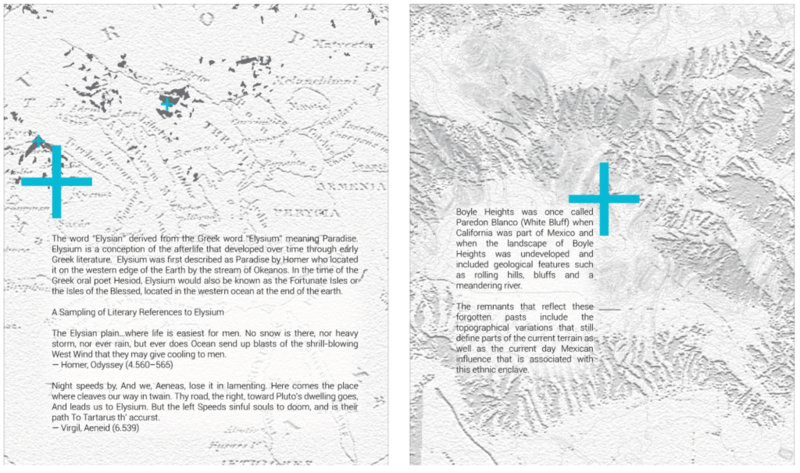 you may “start” at any location and uncover stories embedded within the map’s thickness as you move from one point to the next. The method of navigation used in interacting with the content mirrored the open-ended and episodic structure of Cortázar’s novel Hopscotch, which Sharon’s opera is loosely based on, offering snapshots of places, people, and things, in a stream-of-consciousness narrative. Most importantly, the novel offers various different options for moving through the content: progressively, hopscotching with instructions, or blazing a unique path. The idea for this map was similar, to offer to the reader a story structure that was not necessarily linear.